Someone finally dropped out of that class you wanted to take, and you found a way to change around your schedule so you wouldn’t have any Friday classes. Now, you remember you still need to buy textbooks. Here are tips for finding the cheapest books and avoiding lines when the rush of Amazon packages arrives on campus. Textbooks don’t have to be expensive. Save your GWorld money by renting, buying used and taking advantage of online bookstores. Ask friends who have already taken the class whether the textbook was necessary. Sometimes, especially in large lecture classes, you won’t need the book. It might help to wait until you receive the syllabus to order books so you can see how often the textbook appears in the breakdown of readings and assignments. Try to buy used books from friends: You’ll skip shipping costs and lines at the bookstore. 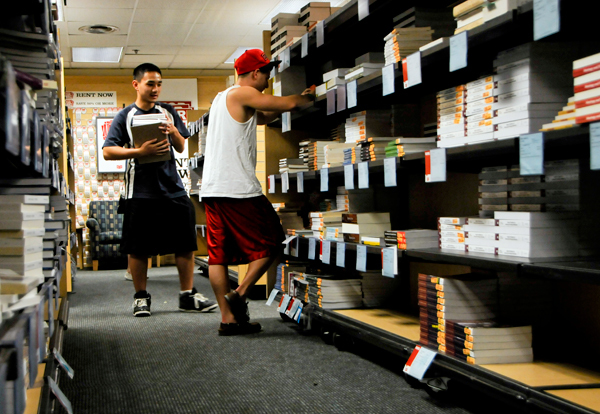 If none of your friends has the book anymore, use websites like Chegg, eCampus and Abebooks that lend and sell books at lower costs than the University bookstore. Another tip: If you plan to take another class with the same professor, hold onto your books – faculty sometimes use the same books for different courses. From textbooks to dorm decorations to those few items you forgot at home, deliveries always flood the package services office in the first weeks of classes. During lunchtime or after most classes finish at about 5 p.m., the line can become monstrous. Thanks to renovations, you won’t have to wait outside anymore, though you should still try to pick up your packages first thing in the morning to avoid the rush. Use the new kiosks in the Marvin Center, support building, Shenkman Hall and Thurston Hall to make sure your package is ready before you wait in line. Even if Amazon sends you an email saying your books have arrived, wait for the email from package services. You don’t want to stand in line for 15 minutes with impatient students just to find out that your package hasn’t been processed yet. It’s no secret the bookstore can be pricey. And while you can try to sell them back at the end of the year, you’ll sometimes find yourself receiving a few dollars for a book that cost $50. But sometimes you need that French textbook that you can’t find anywhere else. Just like package services, the earlier you get there the better. The bookstore does sell out, so order your books online now to ensure you get your books on time. If you need any other supplies from the bookstore like a planner or folder, buy them during the first week of classes before they’re all gone. But if wandering through the pharmacy-like shelves of the bookstore isn’t appealing, you can always try to find some books at a Barnes and Noble or local bookstore.